American DJ’s original Nucleus LED caused a “nuclear”-like reaction among nightclubs and entertainers, because although this hexagonal-shaped unit looked like a classic club centerpiece effect, it actually used cutting-edge Tri-Color LEDs as a lamp source in each of its six scanning tentacles. By replacing the traditional halogen lamp with solid-state LED technology, ADJ brought clubs and DJs the best of both worlds: the “old-school” appearance and scanning action of a traditional centerpiece; and the RGB color-mixing ability, long life, cool running temperature, and energy efficiency of LEDs. 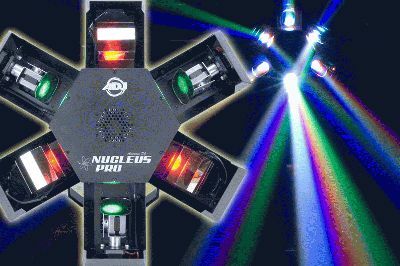 Now ADJ is taking LED centerpieces into the next generation with the unveiling of the all-new Nucleus Pro, an amazing showpiece club effect that’s even brighter than its predecessor and creates more vibrant, stunning colors through the addition of white LEDs to the RGB mix. Powered by six huge, super-potent 10-watt LEDs, the Nucleus Pro delivers an astonishing three times the brilliance of the original! What’s more, each of these LED sources features advanced Quad-Color Technology, being comprised of 4 different-color LEDs (red, green, blue and white) to provide superior RGBW color mixing. With these 4-in-1 LEDs, clubs and DJs can dial up a rainbow of eye-popping colors: red, green, blue, purple, yellow, cyan and of course, white. Featuring a spider-like shape with six extremities just like its predecessor, the Nucleus Pro also includes another new addition that enhances its visual excitement: barrel-shaped scanning mirrors. Equipped with three flat scanning mirrors and three rotating barrel mirrors, the LED centerpiece now produces two different kinds of beams -- flat and rounded – to create a more varied, electrifying light show. The mirrors are controlled by high-quality 1.8° Stepper Motors, which deliver extremely smooth scanning movements. 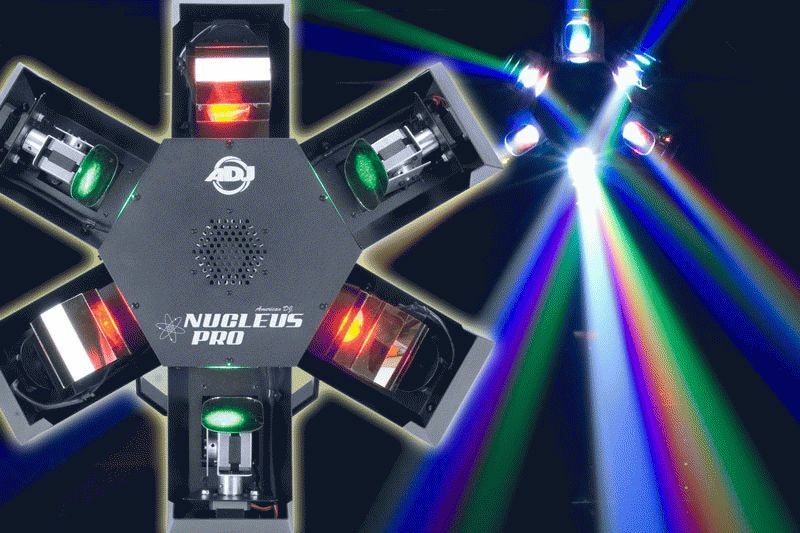 Add in a color strobe effect and some high-energy built-in programs, and the Nucleus Pro is one spectacular dance floor effect that is sure to mesmerize the crowd with its dazzling beams and sweeping motion. The dance floor may be hot “figuratively”, but the Nucleus Pro will help keep it cool literally, thanks to the low heat production of its LEDs. Its powerful LED sources are also very energy efficient, drawing just 155W of power when unleashing their maximum fury. Rated at 30,000, the long-life LEDs rarely burn out, making the Nucleus Pro easy for clubs and DJs to maintain. The centerpiece of all of the action is also a cinch to operate. It can be run in three operational modes: DMX-512, Master/Slave (linkable via a three-pin cable) and Sound Active. When in Sound Active Mode, it can simply be plugged in and run using built-in programs. For those who prefer to use a DMX controller, there are three DMX modes: 4-, 18- and 22-channel. A 4-button LED digital display makes for easy navigation through the DMX menu. Another easy control option is to use American DJ’s remote UC3 controller (sold separately) via a 1/4-inch input on the unit. In-Out IEC Power Connections (Daisy-Chain Power) are yet another feature. Besides being easy to operate, the Nucleus Pro is easy to install, thanks to its dual-hanging bracket and safety hook. Although great for permanent installations, it’s also lightweight and compact enough for mobile entertainment, measuring 22.75”L x 10.5”W x 26.5H/ 577x263x670mm, and weighing 28 lbs./ 12.7 kg. Switchable voltage is available from AC10-240V (50/60HZ) via an IEC plug. The MSRP of the Nucleus Pro is $1,199.99.